There’s a reason people who are really, really into fighting games love playing rock-paper-scissors. When you get down to it, everything from Street Fighter II to Injustice 2 is built on the principles of that ancient hand-game. Players are presented with a limited set of options, each of which can win, lose, or draw when put head-to-head with one of your opponent’s options. The fight itself is a quick-moving game of roshambo where each combatant is trying to predict the option their foe will pick and throw out a move that’ll punish it. Choose right, and you’ll score big; act unwisely, and you’re begging for a beatdown. All the action and flashy stuff on top is a means of tweaking and expanding on those mind-games. 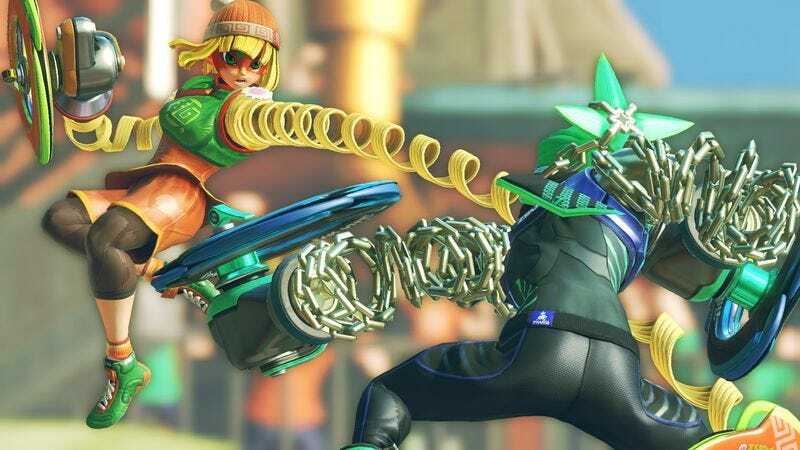 If that underlying philosophy is true, than Arms is the purest fighting game in ages. (It’s only rivaled by Divekick’s wacky, barebones approach.) Like Splatoon, the company’s stylish reworking of competitive shooters, Nintendo’s newest game takes a long-established genre, shaves it down to its essentials, and rebuilds it in a friendly, pristine form. Long after the short-lived fun of jumping into the game and swinging away with the Switch’s impressive motion controls has faded, those who look deeper will unearth a simple yet satisfying engine for the kind of mind-game-filled competition that’s central to even the most complex of its big brothers. Arms takes a more explicit approach to that rock-paper-scissors interpretation than most. Two fighters (or two teams of two, if you’re dipping your toes into the far too frantic four-player mode) selected from the game’s charming cast of cartoon characters are dropped into an arena, and they do battle by flinging their extendable arms across the stage, trying to land punches. At the center of that Rock ’Em Sock ’Em Robots combat is a trichotomy of blocking, punching, and throwing. Blocking nullifies punches, throwing scoops up over-defensive blockers, and punching disrupts an incoming throw. It sounds simple, but remember, you have to rapidly juggle all three options while responding to your opponent’s actions and moving yourself around the level, some of which contain obstacles that can block punches and change the pace of a match. Positioning matters, timing matters, and, above all, getting a read on your opponent matters. These things matter because if you’re up against someone who knows what they’re doing or, even scarier, the game’s merciless computer-controlled opponents, every move you make is a huge commitment and comes with a hefty price. You can’t block while one of your arms is hurdling across the stage, so you best make sure you’re in the clear before you put a punch out there. Throws are easily interrupted or dodged and leave you vulnerable, so an ill-placed attempt can get you punched in the face or thrown yourself. One mistake won’t get you killed and eating a few punches is only natural while you get an idea of what you’re up against, but all those hits add up. Plunking down too many rocks when your opponent is putting out paper will end in a loss eventually. The temptation, then, is to play as conservatively as possible, attacking only with the proper counters when your rival makes a move. While tact and patience are important, Arms has a few twists to discourage a sit-and-wait mentality. For one, every successive punch you block chips away at your individual arm health. If they suffer too many hits, they’ll breakdown momentarily and your fighter will be nearly immobile as they drag the dead limb along the floor. Then there’s the Rush meter. Once filled, you can press a button to power up and unleash a flurry of attacks for big damage. Rush builds with every punch you throw, regardless of whether it lands. While this encourages reckless, mash-filled play, it also forces you to get more proactive about your own offense. Not only is Rush a nice way to finish out a close battle, a full meter is a powerful tool for intimidating and controlling your opponent. It’s like being the smartass kid who might drop an atom bomb into rock-paper-scissors and completely upend the game at any moment. Like every other action, though, you best be sure you’re activating it at the right time. Rush attacks can be blocked and you’re not invulnerable while launching them. And there’s nothing in Arms that feels as bad as wasting your Rush. Complicating things further is the vast arsenal of distinct arms you can bring into battle. Some throw straight punches. Some split into shotgun-like bursts to cover more space. Some sweep to the side to catch dodge-happy fighters. Some sit in one place and fire a laser beam or act as a shield. Each one also has a weight class, so while evenly matched weapons might deflect one another if they connect in mid-air, the biggest of fists plow right through the competition. And each one can be charged by holding down certain buttons, imbuing your next punch with extra properties, like an immobilizing electricity effect. All those considerations add an astronomical number of possibilities to that rock-paper-scissors core, and it takes the mind-gaming aspect a step further, since you’re able to switch out your arms between rounds and adjust your game plan based on your opponent’s tendencies and the character they’re playing. As one would expect, Nintendo has done an excellent job of cramming all of this into a refined and approachable package. The cast is utterly charming, with wacky designs like Byte and Barq, a robot constable and his robot-dog sidekick, and Helix, a stretchy babbling goo monster, sitting next to your more traditional cartoon ninjas and mummies. They’re brought to life with bold color and big animation. The music is lively and infectious, and the main fighting modes—online play, a 1-on-100 gauntlet challenge, and a grand prix that pits you against 10 computer-controlled fighters—sit alongside a handful of fun, disposable mini-games that are good for the occasional distraction. But really, it’s all about the competition. And regardless of how you play—using a traditional controller lets you move with more precision, but motion controls offer an extra level of nuance while aiming attacks—Arms is an easily understood but difficult to execute game of big bets and big consequences. It’s as fundamental as fighting-game fundamentals get, and it’s not afraid to be a punishing teacher. In fact, you can’t even access ranked online matches until you’ve beaten the Grand Prix mode on the fourth difficulty setting, which takes more practice than you’d think, as the AI is shockingly competent and human-like, even on the lower end of the game’s 10 difficulty levels. But when landing punches and outsmarting an overzealous opponent is this satisfying, it’s a pleasure just to learn the ropes. Purchase Arms here, which helps support The A.V. Club.